Russian President Vladimir Putin has pledged to stick to democracy and a market economy, countering critics who see a return to authoritarian methods. "There will be no about-turn in the country's life," Mr Putin told international media executives. "Russia made its choice 10 years ago for a democratic, society-orientated state with a market economy," he said. Mr Putin vowed to tighten the Kremlin's grip over the regions, after the Beslan school hostage tragedy this month. 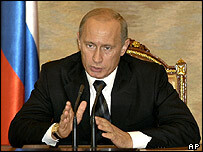 Mr Putin also urged journalists on Friday not to be passive in the face of international terrorism. "I'm convinced that in the condition of a global terrorist threat, that when people are being killed, the mass media cannot be simply observers," he said. He also said terrorism must not be used as an excuse to limit freedom of the press. Mr Putin has proposed nominating top regional officials, including governors, before they are approved locally. The idea - if implemented - could increase the Kremlin's influence on Russia's local politics dramatically. The Moscow Times reported on Friday that 10 governors had signed up to the pro-Kremlin United Russia party this week. Quoting party leader Boris Gryzlov, it said at least 20 others were preparing to join the party. Russia has 89 regional governors, currently elected directly. Some observers say Mr Putin's plans are reminiscent of the party loyalty and central control that characterised the Soviet system. US President George W Bush spoke to Mr Putin by telephone on Thursday and reiterated the need to protect democratic institutions while prosecuting the war on terrorism, the White House said. Mr Putin announced the sweeping political changes as part of a package of tough anti-terrorism measures following the Beslan school siege in which at least 338 people died - nearly half of them children. 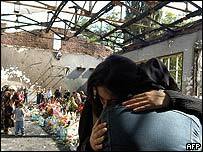 The Beslan attack was claimed by Chechen rebel warlord Shamil Basayev. Russia has called for the extradition of Chechen political leaders living abroad, including rebel spokesman Akhmed Zakayev, who is currently in London. Britain and Russia are working on a new UN Security Council resolution to stop terrorists evading justice by hiding behind asylum and refugee laws. "The President today insisted Russian democracy was safe in his hands"